Clutch your tiny 6.5-ounce returnable glass Coca-Cola bottle close if you’ve got one, because there won’t be any more where that came from. A small Coke bottler up in Minnesota says the last one rolled off the production line, and it isn’t going to make any more of that same kind because it just doesn’t make business sense. Darn you, business sense! 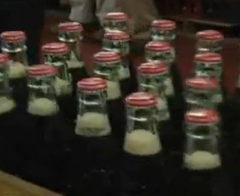 Times used to be, since 1932 the customers in the four counties supplied by the Winona, Minn. bottling company could drink their fill of Coke and then return the bottles for $0.20, reports the Associated Press. But the last run of about 6,000 refilled bottles was this past Tuesday. There are still plenty of 8-ounce glass bottles around the country — they’re recyclable and have less glass but more of the fizzy stuff inside. Since these 6.5-ounce bottles were made in such a limited quantity and only distributed to those four counties, the equipment to make them isn’t easy to fix. “They were made on an old line that would have to be completely replaced — they kept them going as long as they could,” said a Coca-Cola spokeswoman. At a certain point, the bottles often weren’t even getting returned anyway as people kept them at home as little bits of American nostalgia. Getting a piece of that vintage Coke product will now cost a bit more, as the company is going to sell that last run for $20 each. Proceeds will benefit the local Winona Pedestrian and Bicycle Path restoration project.